Welcome to Modern Dental! If you are looking for a dental office that provides comprehensive services for all members of your family in a caring, comfortable, and professional environment, look no further. Our goal is to provide our patients with unparalleled service, and a dental office where they can be at ease, knowing they are in good hands, meanwhile enjoying a luxurious environment that exudes comfort and sophistication. At Modern Dental you never have to worry that you’ll see a different dentist at every visit, or be faced with the impersonal structure of a corporate dental office. We are family owned and operated and plan to keep it that way forever. Our core values are: professionalism, ethics, excellent patient care, and superb customer service and compassion. Dr. Mitchell Kim grew up in Mesquite, Texas. He graduated from Pepperdine University with a B.S. in Sports Medicine. Afterwards Dr. Kim attended Baylor College of Dentistry where he received his Doctorate of Dental Surgery in 2005. He has since been practicing in the DFW metroplex. Dr. Kim continues his education to keep up with advances in dentistry so that he is able to provide the most up to date dental care for his patients. Dr. Kim enjoys traveling, running, and spending time with his wife, Dr. Blanca Peña. From routine dental examinations and treatment such as fillings, teeth whitening and dental hygiene services, to complete smile makeovers and emergency services, Modern Dental can give you the rejuvenating and confidence boosting smile you are searching for. Your comfort and satisfaction are our priority. Smile with us. Smile in style! 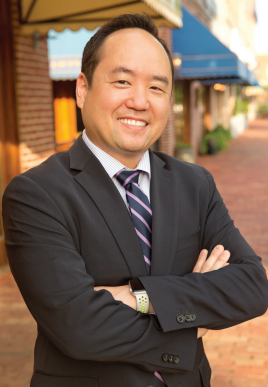 Read More About Mitchell Kim, D.D.S.